I’m back with installment #2 of Details and Inspiration from the Chic Chateau Showhouses. 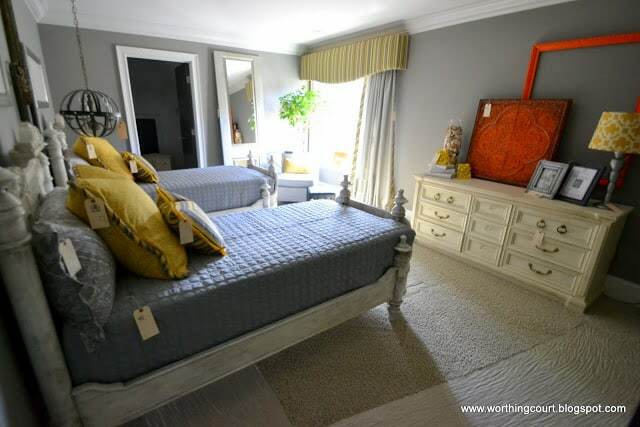 Today we’re going to be looking at the master bedrooms, all of the other bedrooms and all of the baths. There are lots of pics here, so sit back and enjoy! 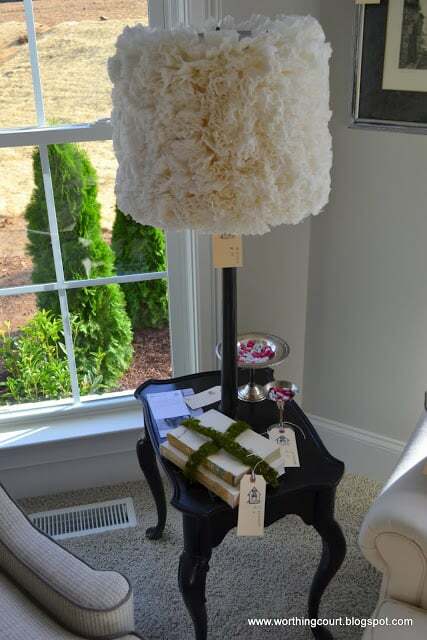 This adorable shade was created by using bunched up coffee filters hot-glued to a shade found at a thrift store. 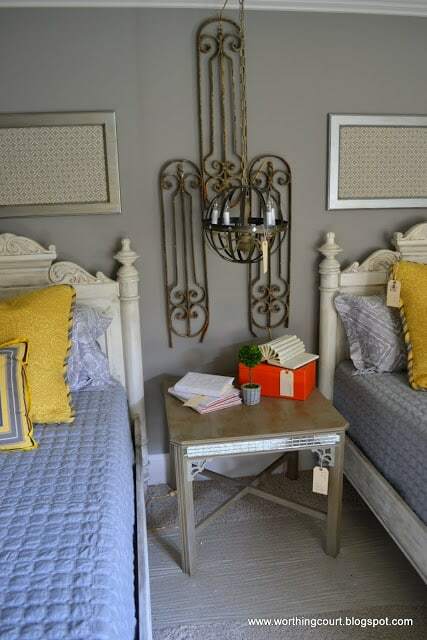 Love the bulkiness of the frame on the mirror hanging above the dresser. 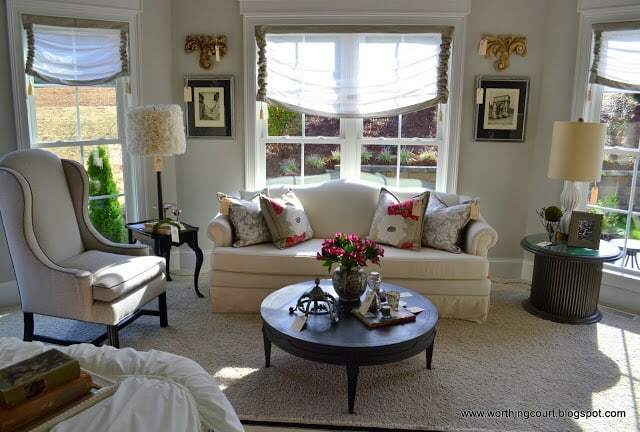 The sitting area in this master bedroom is so bright and airy. Loved these little built in shelves tucked into a corner. A closer look at the bed crown. This would be really easy to duplicate. The drapery panel hanging behind the chair isn’t covering a window. There was a panel hung on each side of the opening to the sitting area. Take a look at the picture above of the entire room and you can see how it helps to balance and soften the room. 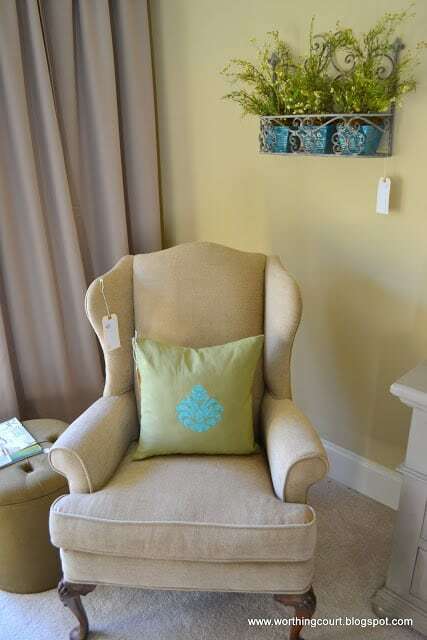 Love the cute little pots placed in a metal rack hanging above the chair. 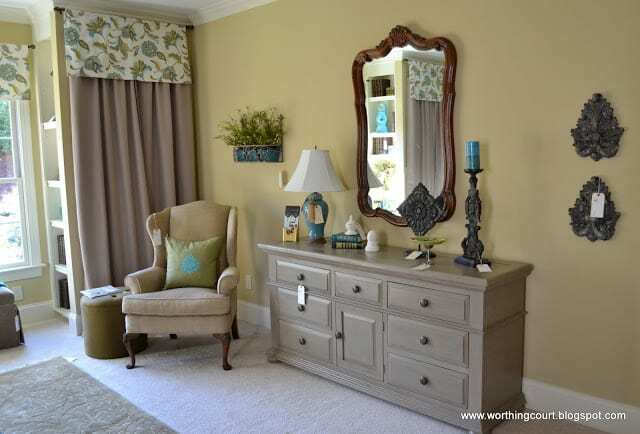 Notice the painted vintage tin and empty frame that are propped against the wall on the dresser. Totally unexpected since this is where you’d normally see a mirror. Need inexpensive art? 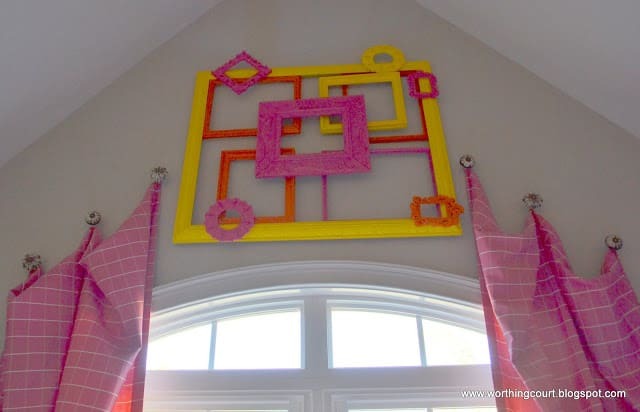 Frame some fabric that coordinates with the colors in your room. It’s a little difficult to see, but the designers hung an orb light fixture from the ceiling in lieu of a lamp on this bedside table. Vintage metal garden pieces have been turned into art. 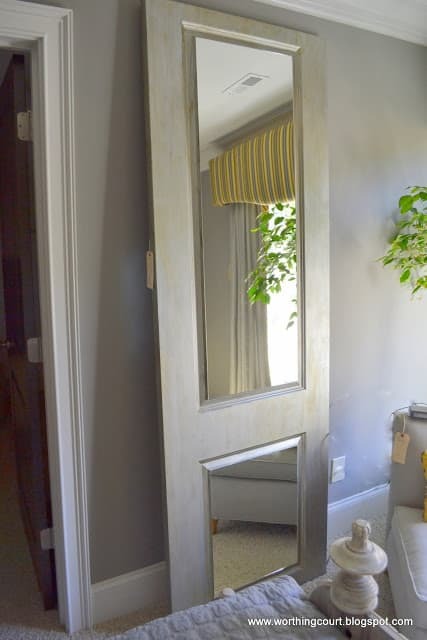 This vintage door was turned into a full length mirror. 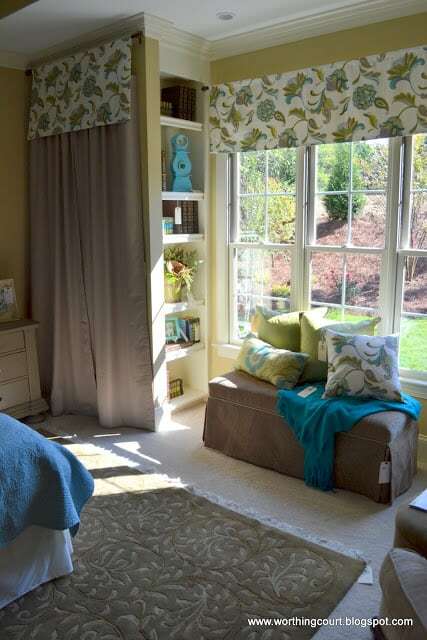 Great way to visually expand the space and add natural light to the room. 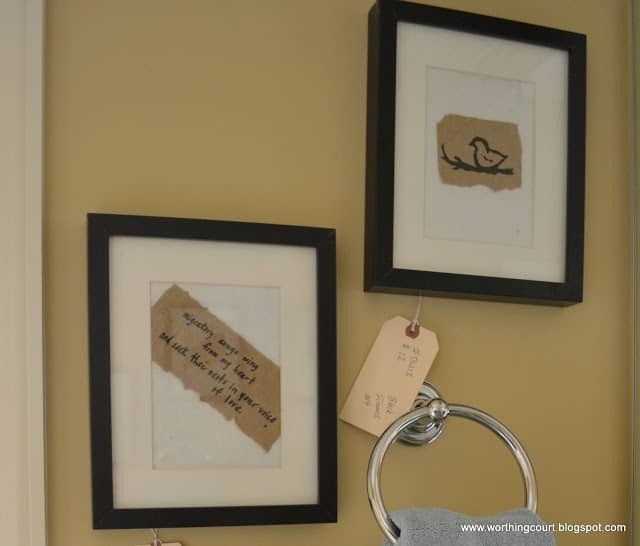 Repurpose frames by painting them a bright color and layering them on the wall. Instant art! 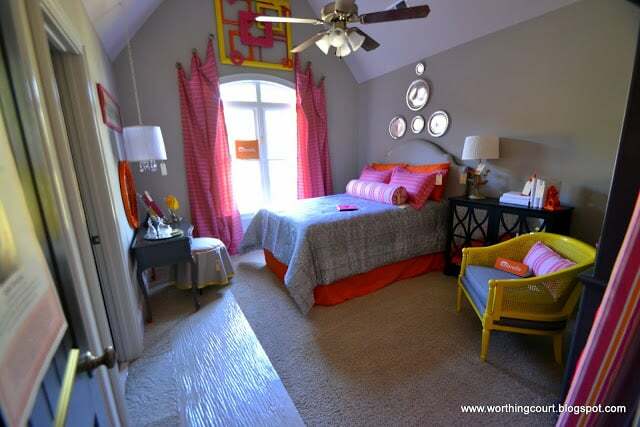 Notice the pendant light instead of a lamp on the dressing table. A vintage stool is covered with a bit of fabric trimmed with ribbon. 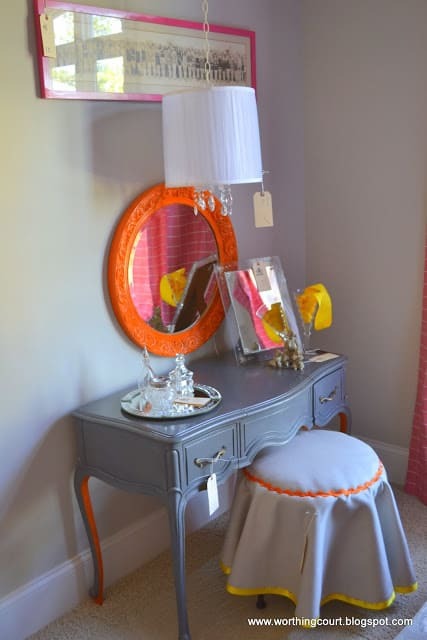 Painting the inside of the legs on the dressing table adds a pop of color in an unexpected place. Vintage silver trays make great wall art. 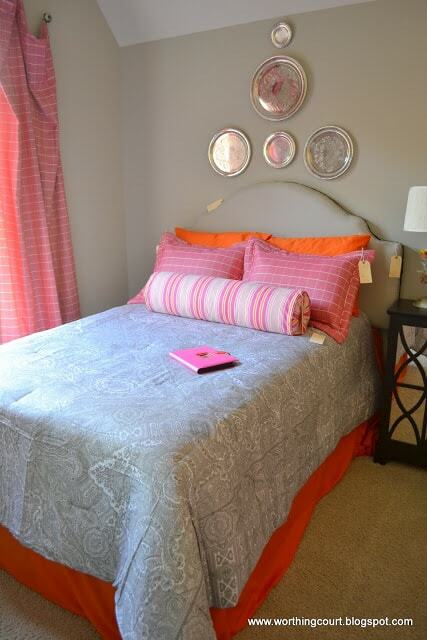 The color of the trays works well with the wall color, coverlet and mirrored chest. 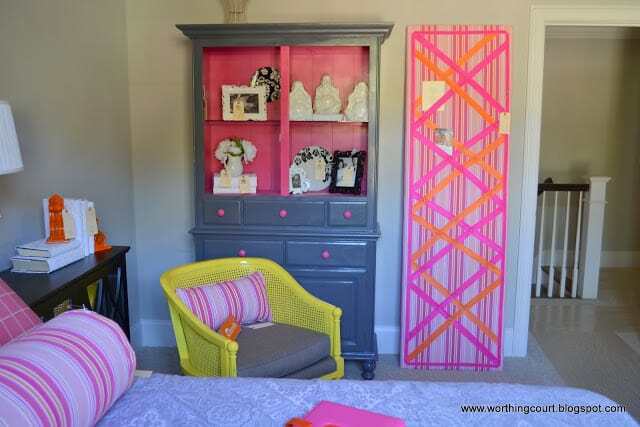 This was originally a china cabinet that has had the doors removed and has been painted to work in this room. Instead of a pin board hanging on the wall, how about a large one leaning against the wall? 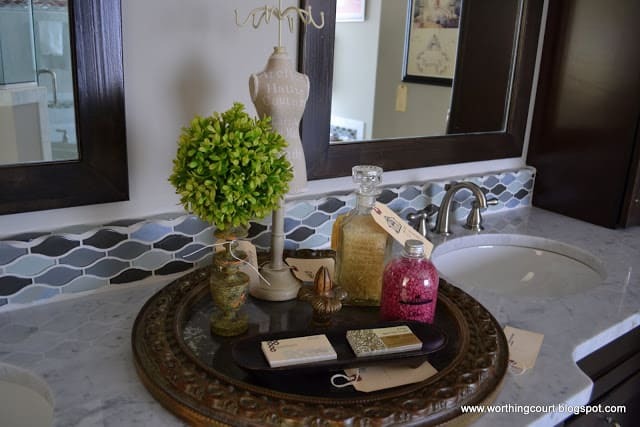 A round mirror made a great tray for this pretty vignette in the master bathroom of house #1. 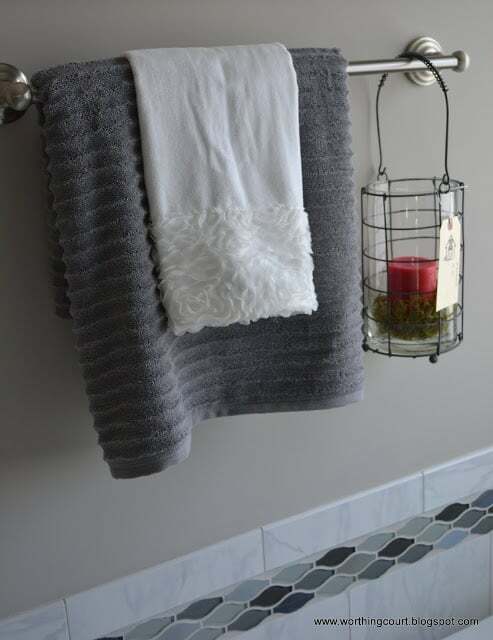 I loved the idea of hanging a candle from a towel bar. 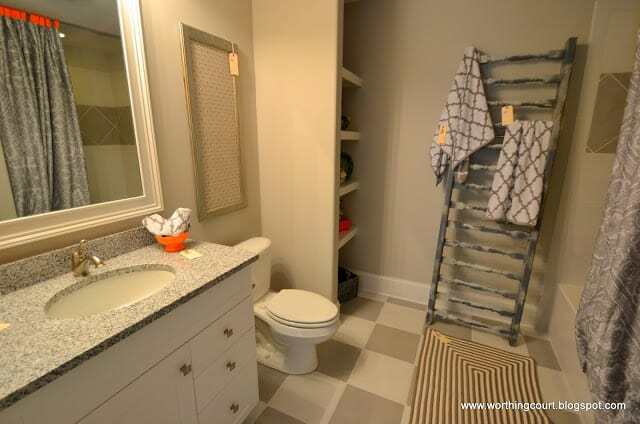 Of course, I love the ladder being used as a towel rack. But take a look at the reflection of the shower curtain in the mirror. 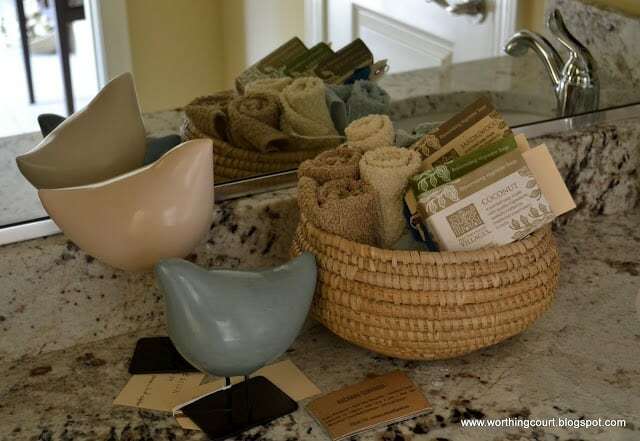 The tabs are made using a fabric that pulls the accent color from the bedroom into the bathroom. 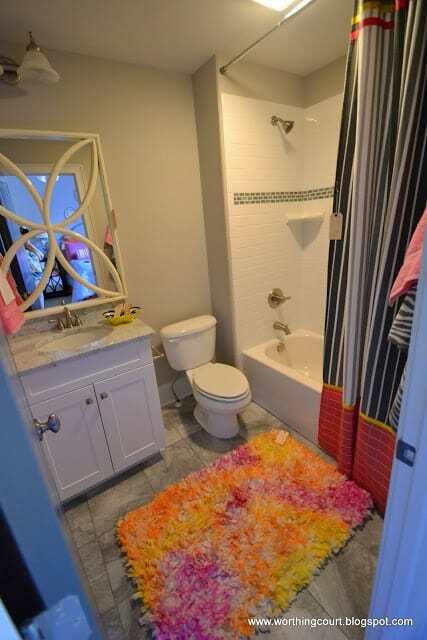 Love the mix of fabrics and ribbon on the shower curtain. Any idea how the color treatment was done on the rug? I couldn’t figure it out. Talk about inexpensive art! These were made with pieces of torn paper bag and a Sharpie. 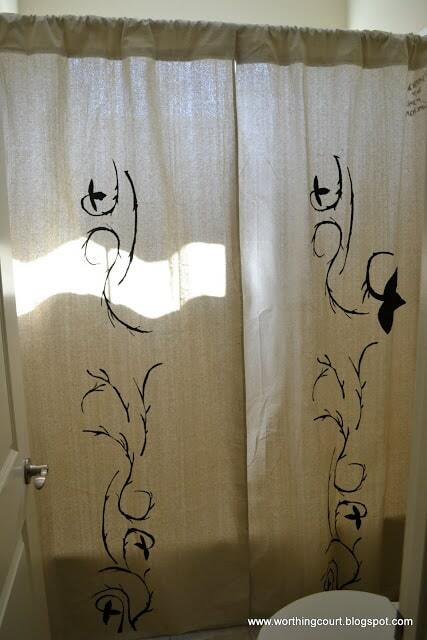 And lastly for today…This picture doesn’t do this stenciled drop cloth shower curtain justice! Phew! That was a long one! Come back tomorrow when we’ll look at Details and Inspiration from the rest of the Chic Chateau Showhouses. 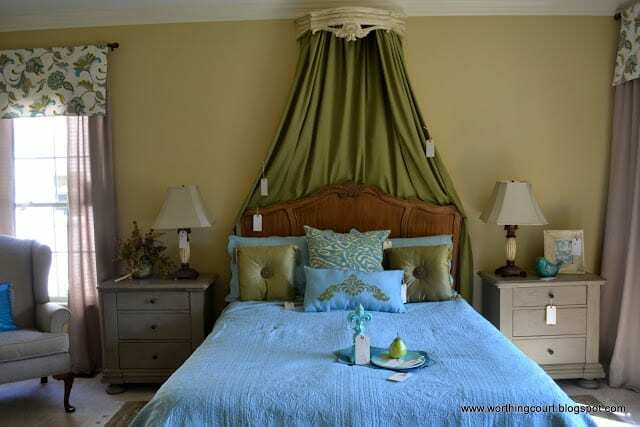 Love these pictures the Master bedrooms are huge. 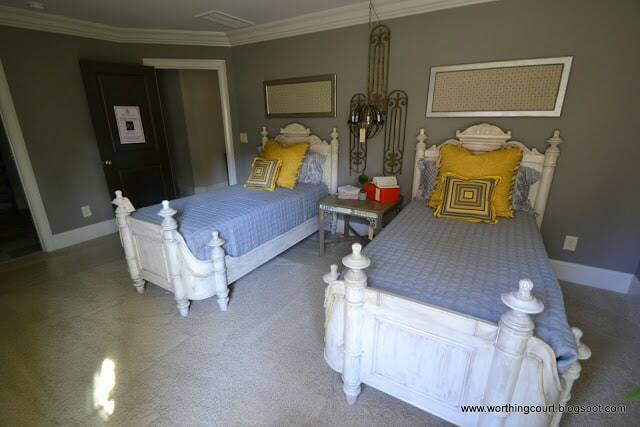 Beautiful bedrooms and baths!! 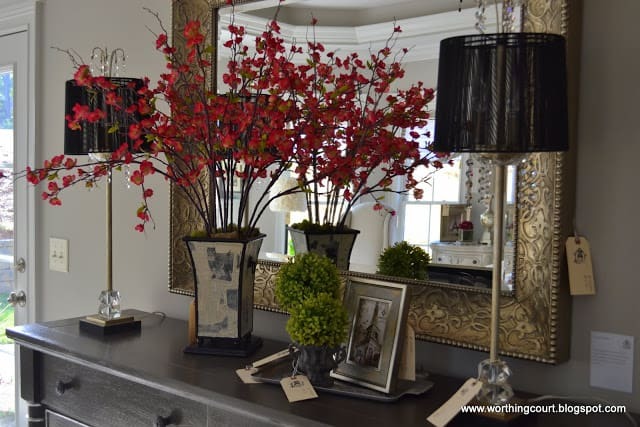 !…I am really sorry that I missed the home tour…I see something I would love to buy every time you blog about the house!!…. I don’t know how they did their rug, but I can tell you how I did mine, and it came out pretty similar. Buy one of those rubbery underrug mats that are made of the big square…maybe 1/2 inch openings…mesh. Buy T-shirt knit fabrics in the colors you want the rug to be. Cut your pieces 1″ wide and 5″ long. Bazillions of different color pieces..
Take one piece and tie it to each crossbar of the rubbery mesh, with an overhand knot. Be sure that you have all of the tails facing the same way, and that will be the top of your rug. Mix up your colors OR draw a picture on the mesh with sharpies,and then fill in the design with the specific color strips, and you will have a “picture” when you finish! Thanks for sharing!!! I see several ideas I’d like to replicate.